Brexit - who will make it happen? I try mostly to stick to climate at Moyhu, maybe sometimes straying into maths. But I see our contemporaries all have something to say on it - Sou, Stoat, ATTP, Eli, and even Lord M.
One reason why I tend to avoid politics in blogging is that the information content tends to be low. Plenty of other people would say what I would say, and it all gets predictable. But for the record - yes, I think Britain should have stayed in the EU. I'm old enough to remember when Britain originally shied away from EEC membership, and then through the hard work of Ted Heath and others, was able to belatedly join, suffering some disadvantage from the delay. I was actually in Britain in June 1975 when the first ever national referendum was held, getting support for (by then negotiated) EEC membership by 66%. I think Britain's sparing use of referenda is justified. In Australia we have them fairly frequently. There is provision for them in the constitution, which adds the requirement to succeed that have to get not only a majority of voters, but a majority of states (ie 4 out of 6). Consequently, it takes a substantial majority to succeed. In this post I don't want to dwell on the rights and wrongs of the actual vote, but just to raise a question that puzzles me. Who will actually implement it? That issue seems to be a tangle built into adding referenda on to parliamentary government. It hasn't affected us much, because referenda only succeed with bipartisan parliamentary support, with the extra burden of 4 states approving. And they tend to be issues which would not anyway affect the fate of governments. We have one coming up on gay marriage. Probably the most noted in recent times was the referendum on becoming a republic. But even if that had passed, it's unlikely that PM Howard, who opposed it, would have felt required to resign. Anyway, what I'm writing about here is the mechanics. Exiting the EU in a reasonable way will be a very hard task. It will require acts of parliament, some of which may be unpopular. How will it be done? hoping it works. Please let me know of any problems in comments. You'll see the URL come up automatically as https:. I've taken the opportunity to reorganise the blog resources ( images, scripts), and there are many ways this could have gone astray. But I'd especially like to hear of HTTPS security warnings. I think everything, including past posts, should be HTTPS OK, but lapses are certainly possible. As I've mentioned in previous posts here and here, I think HTTPS for blogs is nothing but a nuisance, but likely inevitable. So I thought I should retrieve something by using the needed search for HTTPS changes to change other things needed - eg images served from now uneliable sources (copied to better places). Old posts may work better now. Also, of course, I can still at this stage turn the switch back . TempLS mesh, reported here (as of 8 June, 4221 stations), was down from 0.934°C in April to 0.744°C in May (base 1961-90). This continues the post El Nino decline noted in the NCEP/NCAR index (down 0.164) and in the satellite measures ( RSS down 0.23° UAH down 0.16). But SST is only slightly down. 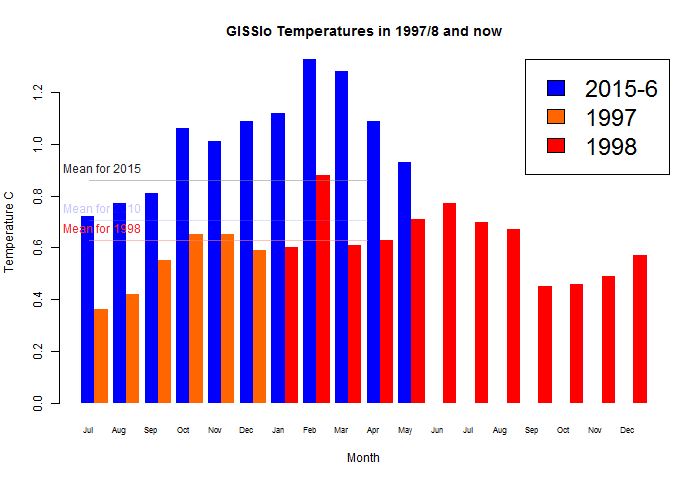 The main cool spot was in Siberia, which was very warm during El Nino. Also US, S America around Paraguay, and a spot in the N Pacific. Warm in other boreal regions, Europe, and (unusual recently) Antarctica. The breakdown shows most regions not very cool, but only moderately warm. In other news, JAXA Ice melting has slowed in recent days, but ice is still well down on past years.. I have been describing a new Moyhu index made by integrating the NOAA gridded sea surface temperature ERSST V4. I have added it to the data on the latest data page. You can find on the monthly table, where it currently sits with the secondary sets, and the new value is right down in the bottom right corner after scrolling. This table is getting unwieldy, and I'm going to reorganise. You can also find it in the updated active graph. The big virtue of ERSST is that it is released early in the following month, and it is now out for May. There will be a revised version later in the month. I'll show plots below the jump. SST has been settling gradually following the El Nino, and in May, the ERSST index dropped from 0.411 to 0.383°C, on an anomaly base of 1981-2010. 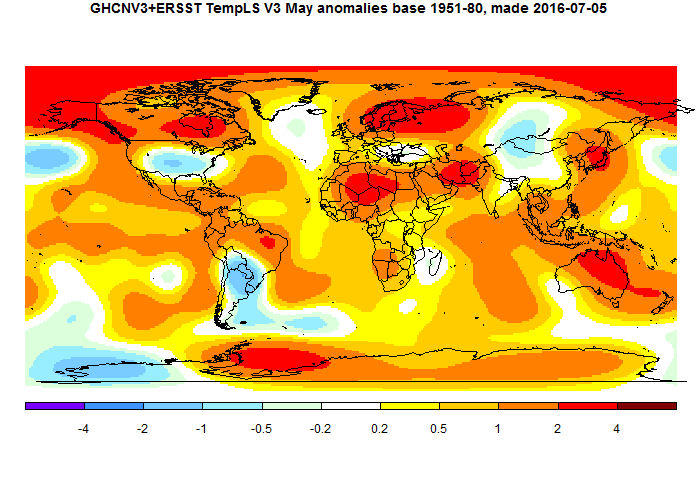 The NCEP/NCAR index continued its steady descent in May, from 0.635°C in April to 0.471°C in May (anomaly base 1994-2013). That is down about 0.3°C since March. However, it is still the warmest May in that record. Breaking the pattern of recent months, it was rather cold in Siberia and N Asia. Warm in Australia and Central Europe. Cool in S USA, but warm in W Canada. The ENSO plume is now rather cool. I should mention that at WUWT, Walter Dnes is doing somewhat similar analysis, with regression-based links to the major indices. His NCEP/NCAR integration gives similar results. In other news, UAH V6 also dropped considerably, from 0.71°C to 0.55. But Arctic Sea Ice is still well down on previous years. This post arises from my integration of the NCEP/NCAR reanalysis, described here and here. I have been a little discontented with my method of integrating on a regular lat/lon grid on a sphere. I tried what is usually a very good method - direct trapezoidal integration, with cos weighting for latitude. It worked fairly well, but there was an oddity, in that it gave zero weight to the pole values. That didn't seem right, so I used another method in which cells were weighted by the midpoint values of cos latitude, but with the temperature average used for the cells. That gave finite weighting to the poles, but I still wasn't sure if it was right. I should emphasise that this is a very minor problem. There are 10226 separate values to integrate, so if two are wrongly weighted, that probably doesn't make a difference at three significant figures. However, I was motivated to review it by some recent posts by Walter Dnes at WUWT. He is doing something similar, and apparently carefully and well. He has cross-checked with my calculations, and reports good agreement with small discrepancies in the third significant figure. Since I found good agreement with NOAA PSD too, that is all reassuring. However, I would like to resolve discrepancies if possible. There are many possible sources. Calculating the anomaly base is one. I mentioned in this post some leap year issues; that is a very likely source. But I thought I should in any case review my treatment near the poles.